Don’t live anywhere near the Acoustic Ross touring zone? 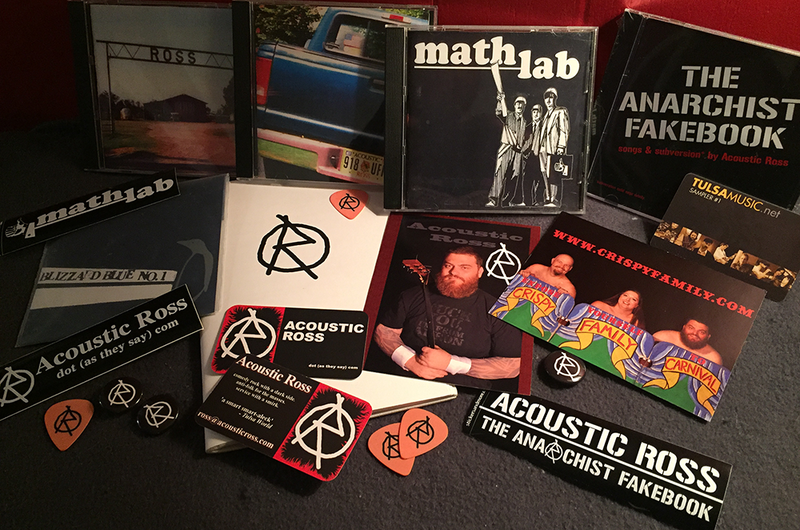 Can’t wait for the next Acoustic Ross show to get some cool crap? Don’t want to have to sit through another error-riddled Acoustic Ross show to get your hands on the goods? Your wish = our command. All PayPal prices include shipping. Buying stuff direct from Acoustic Ross Central will probably even score you some free junk too. In case you were wondering. individually, album by album, or all in one swell foop, right here on Bandcamp. A smattering of selections from the first three albums, mostly remixed and remastered. The inaugural sampler release from TULSAMUSIC.NET. Includes a brand new remix from me, plus Tony Romanello, Tim Casey, Radio Wave Days, Future Depression Sound, and tons more. Name your price and download it here. A great cover-song blog called Cover Freak put together this excellent Frank Zappa tribute, and I’m on it. My contribution is a low-fi take on “What’s The Ugliest Part of Your Body?” The collection is FREE and you can download any and all tracks here. My zine, founded in a tiny dorm room in 1991. Errata, Ephemera, Et Cetera. Check out the latest issue, clippings and the entire back issue archive here.